Glow-in-the-dark bike paths « Adafruit Industries – Makers, hackers, artists, designers and engineers! 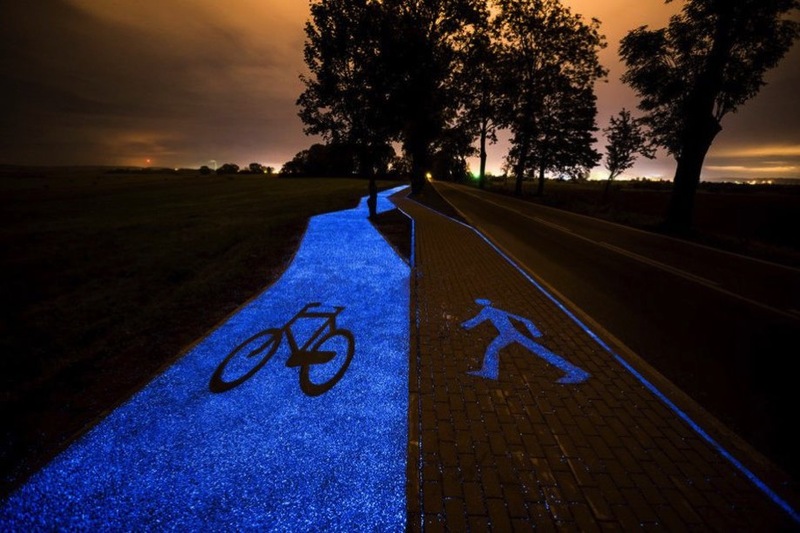 Talk about combining sustainability and safety: Poland recently unveiled a glow-in-the-dark bike path that is illuminated by sunlight particles collected during the day. Biking on a narrow path next to a road in the dark may have been dangerous before, but is now turned into an exciting experience. The path, which is near Lidzbark Warminski, lights up in bright blue at night to guide cyclists safely home. TPA Instytut Badan Technicznych Sp. z o.o. is the first company to design a luminous bike path in Poland. They were inspired by similar concepts in Amsterdam, where one company designed a path influenced by Van Gogh’s “The Starry Night” painting. Unlike the Starry Night path, however, TPA’s glowing path doesn’t require a power source. Instead, it is completely self-sufficient. It relies on phosphor—a synthetic material— to collect sunlight which then enables it to light up luminophores at night for up to ten hours. While this path is the next step in creating smart and sustainable roads of the future, it is still in its test phase as the creators do not know how long the material will last before it wears out.